After two years of fractious debates, mass street protests, and political assassinations, Tunisia’s new constitution has been hailed as a model of what consensus politics, dialogue, and compromise between Islamists, secularists, and liberals can achieve. An overwhelming majority of the National Constituent Assembly (NCA) voted in favor of the text, which entered into force on February 10. However, the give-and-take inherent to compromise also resulted in ambiguous language in key articles. This has led some to characterize the document as schizophrenic and others to express concern about the undue burden placed on new institutions like the Constitutional Court, which will have to ensure these ambiguities are interpreted in a balanced manner by any new government. Packaged in various shapes and sizes, a constitution can be understood as a roadmap for the acquisition and exercise of power and for the peaceful management of relations between the state and citizens, and among citizens themselves. While these foundational texts are “human creations…shaped by convention, historical context, choice, and political struggle,” thoughtful constitution making involves the judicious combination of two main components: process and substance. 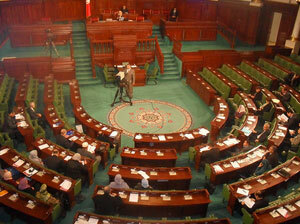 With this in mind, what are the merits and shortcomings of the newly adopted Tunisian constitution? Key elements in the process of constitution making—particularly for countries transitioning out of authoritarian rule—are inclusivity, participation, transparency, consensus, and national ownership. In Tunisia, following divisive and acrimonious debates and boycotts within and outside the NCA, deputies finally came to the realization that electoral legitimacy and partisan politics were not sufficient to produce a quality constitution. Four main processes and procedures facilitated the painful but successful birth of the new charter. The first was the countrywide consultations conducted by the NCA deputies with civil society organizations and the public at large, both in person and writing. An estimated 100,000 people were consulted. Also instrumental were the numerous symposia on constitution making from historical and contemporary perspectives organized by local NGOs with the support of outside funders, including the United Nations Development Programme (UNDP). The second process was the national dialogue masterminded by four powerful and nationally trusted civil society organizations that, at the height of severe political and ideological polarization, brought the main political parties together and hammered out a political roadmap. According to this document, national stakeholders committed to pursuing three simultaneous results: an independent government of technocrats whose members are not allowed to participate in the next elections, a consensual constitution, and an independent electoral management body. All three have been designed to remove narrow political calculations from government until the next elections. The Quartet, as these civil society organizations were called, proved critical in creating propitious space for the constitution-making process and helping the parties overcome blockages arising from disagreements over sensitive provisions of the draft constitution. Despite being a country without a strong parliamentary heritage, these and the other internal processes introduced by the NCA have been heralded as laying a strong foundation of strong governance to come. The third process milestone was passed early on, when the NCA decided to require a two-thirds majority for adopting the final text of the constitution, rather than by simple majority. The net result of this decision was that, as stated in Open Democracy, “no single party or political bloc could hope to unilaterally impose a constitution on the country as happened in Egypt.” This simple but powerful voting rule compelled Assembly deputies across ideological and political divides to compromise and gave negotiations over contentious provisions a dynamic pull toward the political center. Although it caused much frustration and drama within the Assembly, it ultimately resulted in a consensual text that enjoyed greater popular legitimacy. A final factor that greatly facilitated the push to the finish line was the advisory and financial support of external players such as the European Union, UNDP, and neighboring Algeria. In this context, the most salient provisions relate to the relations between state and religion, human rights, gender parity, the distribution of executive power, and the various constitutional mechanisms envisaged to serve as watchdogs during the implementation phase of the new charter after the next elections and beyond. The issue of relations between the state and religion may have been the most divisive, generating highly charged debates within the NCA and among the public at large. The compromise language that was finally hammered out to accommodate the various firmly held beliefs is reflected in the ambiguity between Article 1, which states that Islam is the religion of Tunisia, and Article 2, which indicates that Tunisia is a “civil state”—generally understood to mean neutrality towards religion. For some analysts, this apparent contradiction is the price to pay for not having sharia law incorporated into the constitution as a foundational legal framework. Restrictions that had previously handcuffed rights and freedoms in Tunisia were removed from the new constitution, which lists all broadly accepted constitutional rights and liberties in political, social, and economic spheres (Chapter II), and affirms the superiority of international agreements over national laws. However, there are caveats: individual rights and freedoms may be legally infringed upon “with the purpose of protecting the rights of others or where required by public order, national defense, public health or public morals, while ensuring any restrictions are proportionate to the intended objective” (Article 49). Such exceptionalism raises significant concern, particularly because of the onus that will be put on the courts and constitutional oversight mechanisms charged with constraining the overreach of the elected branches. With regard to gender, Tunisia rightly prides itself as hailing from a long tradition of gender equality and women’s empowerment. At the dawn of its independence in 1956, Tunisia adopted a Personal Status Code that guarantees fundamental rights and freedoms for women. However, this rather progressive set of laws was pushed through and nurtured by successive authoritarian regimes, with scant public debate. In contrast, the rights afforded women in the new constitution came about as a result of a democratic process, making people more comfortable with its contents. In addition to confirming the acquired rights gained under the Personal Status Code, the new charter treats women as equal citizens (Article 21), affording them rights that range from the right to work and stand for the position of president (Article 74) to the right to state protection against violence (Article 46). Although the early language of making women “complementary” to men has been banished, the framers of the new constitution did not abolish all forms of discrimination against women, particularly regarding issues of inheritance and child custody, matters still governed by sharia law. The latter notwithstanding, Tunisia can still claim to have cobbled together the most progressive rights and freedoms of any constitution in the Arab world. Tunisia’s lawmakers and politicians ultimately decided to distribute executive power in a semi-presidential as opposed to parliamentary system of government. This was a compromise, as the dominant, Islamic-centered party, Ennahda, had favored a parliamentary system after its victory in the 2011 elections. However, it is widely acknowledged that a semi-presidential system carries risks for post-conflict countries, particularly given the potential deadlocks between head of state and head of government. Despite a history of dictatorship and abuse of executive power, the new constitution nonetheless provides the president with rather sweeping powers over the security forces without providing a detailed description of what this power entails (Articles 77, 78, and 80). The above notwithstanding, many constitutional experts believe that the inherent risks associated with a semi-presidential system could be tempered by the institutional checks and balances the constitution prescribes (Articles 101, 125–130, and 60). For example, the Parliament’s powerful finance committee, which is charged with the final review of the state’s annual budget, will be chaired by the opposition, and the latter “shall also have the rapporteur position within the foreign affairs committee and shall have the right to establish and head an investigative committee per year” (Article 60). In addition to significant democratic guarantees, this constitution introduced notable innovative articles, including the right to a clean environment, the establishment of a sustainable development commission, and the creation of a high council of local authorities that will provide an important forum to address local needs and priorities—a particularly cherished victory for more grassroots oriented NGOs and political parties. The major challenge facing any constitutional engineering lies in implementation, as opposing politicians and lawmakers start interpreting the “constructive ambiguity” of the various key provisions discussed above. New governments seeking to execute their political programs will not be constrained by the consensus logic of the two-thirds majority that guided the final adoption of the new constitution. They will most likely push these programs through legislation, judicial actions, or administrative measures. It is at this stage that the built-in safeguard mechanisms and checks and balances will come into play to help ensure that these measures are in conformity with the spirit and the letter of the constitution. While the constitution itself will not solve the country’s persistent unemployment, rising prices, and crushing debt, political observers and constitutional scholars maintain that it will move politics in Tunisia forward and reassure foreign investors that the country is headed in the right direction. Tunisians will be anxiously waiting to see how fast this legislative triumph will translate into tangible improvements in their day-to-day lives. Youssef Mahmoud is a Senior Adviser at the International Peace Institute. Margaret Williams is a Research Assistant for the Middle East program at the International Peace Institute.